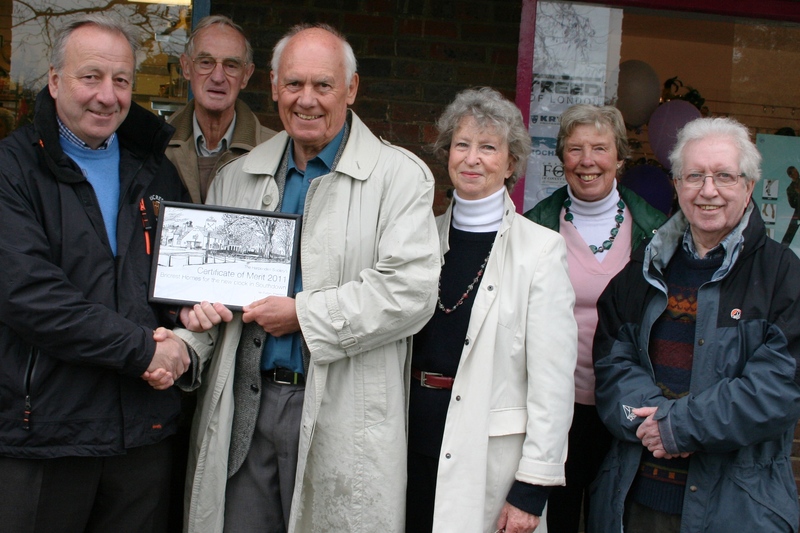 The Harpenden Society presented the annual “Harpenden Society Award” to the new development in Thompson’s Close in Harpenden comprising Breathing Space fitness club and Blueberry Café. Chris Marsden presented the award on Wednesday 13th July 2011 to Keith Lunn the owner of the businesses; Chris explained that the awards are presented for developments which enhance the environment. Clare Butterworth spoke on behalf of Clague, the Harpenden architects responsible for the design. “The challenges were more to do with the Flemish bond brickwork to respect the conservation area location. We had to work closely with the clients to minimise the impact of the build on their existing business. The building gives a welcoming frontage to those approaching from the High Street. A number of society members attended the presentation which was held adjacent to the wall where the commemorative plaque will be affixed. Chris said that the development has transformed what was previously a gloomy and scruffy area. 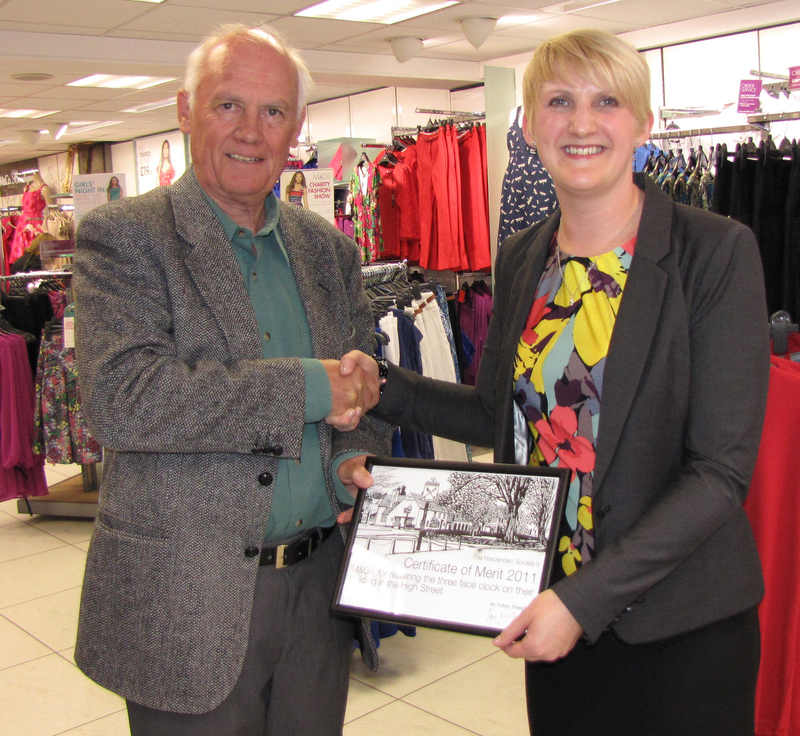 Chris Marsden, The Harpenden Society Chairman, presented a Certificate of Merit to Deanna Rogerson, M&Co Area Manager, to recognise the contribution that M&Co has made to the town by restoring the clock at the front of its premises to full working order. Bricrest Homes Ltd own some of the shop premises in Southdown including the Grove House charity shop. 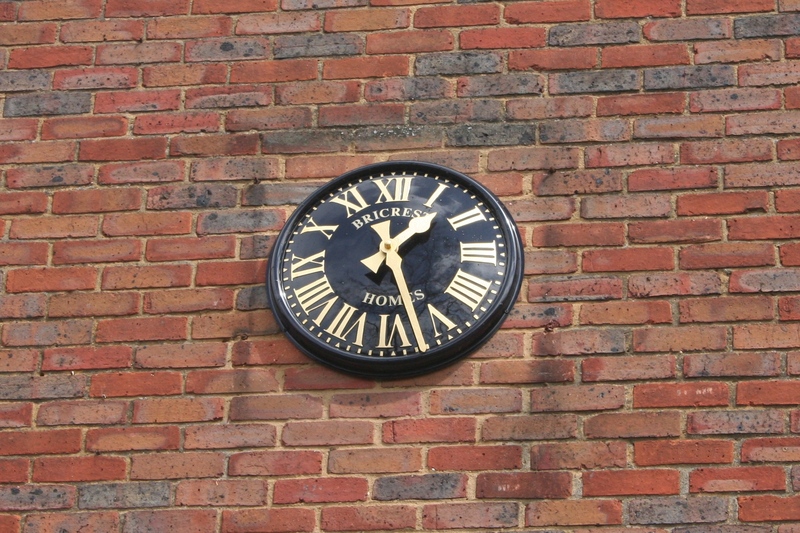 For many years the clock on the external gable end wall has not been working so Mike Taaffe Managing Director of Bricrest Homes decided to purchase a new one. After considerable research a new clock was purchased and installed by Bricrest. Chris Marsden, The Harpenden Society Chairman, presented a Certificate of Merit to Mike Taaffe of Bricrest Homes and Chris commended Mike for his generosity and contribution to the community of Southdown. Above - Chris Marsden (centre) presents Certificate of Merit to Mike Taaffe of Bricrest plus Harpenden Society members. The Bricrest clock in Southdown. Southdown residents have been tidying up and improving the communal open space, Greenway Spinney, which is adjacent to Meadway, off Grove Road. The residents, known as ‘Friends of Greenway Spinney’, are grateful to resident Patrick Fisher who created a wattle fence the open space; not only did he grow the materials for the new fence he constructed it too. 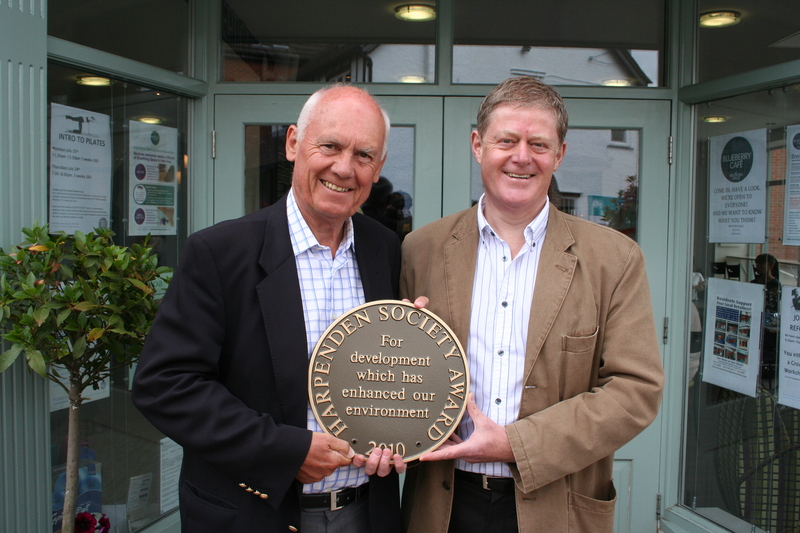 The Harpenden Society has sent a Letter of Commendation to Patrick in recognition of his work on behalf of the community.